The sky was still dark when we left the motel at Stovepipe Wells on the western end of Death Valley National Park. The car headlights seemed to disappear on the asphalt pavement; the reflecting yellow road stripes the only evidence of being on track. Reggie and I were heading east across the great rift called Death Valley. Our destination was a little known side trip through Titus Canyon that was recommended by the ranger at the Visitor Center at Furnace Creek, a number of miles south of us. We wanted to get an early start on our day trip and, since we were from Indiana, the 3-hour time change was to our advantage. The road was empty, and we could see no other headlights over the vast expanse of the valley. The eastern sky changed from black to a deep, dark blue as we passed over the eastern ridge of the valley. The barren mountain ranges came into focus along with the realization of the great expanses of emptiness. We stopped at the pass, got out of the car and inhaled the crisp morning air. Behind us a lonely meandering set of headlights could be seen from a distant car descending into the valley from the other side. A brisk breeze brought the scent of salt from the evaporated lakes ahead of us. We watched as the sky changed to lighter hues of blue as the sun approached the summit of an easterly mountain range. This Death Valley sunrise rivaled any sunrise that I had seen before in its display of pastels, color changing hues and magnificence. Before starting the Titus Canyon trip, make sure and check at the ranger station in Furnace Creek or at the posted notices at your motel to see if the canyon road is open. Since it can be closed due to flash flooding, it is also wise to check the weather forecast for any weather conditions conducive to thunderstorms. Make sure your vehicle is full of gas and in good mechanical condition. A lunch and extra water, along with a snack, make for a great time in the upcoming trip. When you leave the comfort of Stovepipe Wells keep in mind that there are no further services available on this backcountry tour. 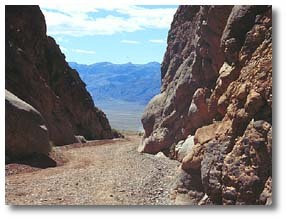 The road to Titus Canyon is a one-way road going east to west. 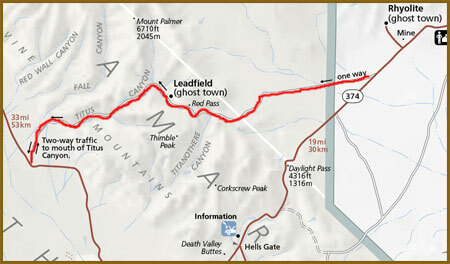 Take highway 374 east from the junction of 190/374 near the sand dunes and just east of Stovepipe Wells. The highway travels east through the park over Daylight Pass, heads for the old ghost town of Rhyolite and then on to Beatty, Nevada. Just a couple of miles after exiting the park, and a couple of miles before Rhyolite, there is a marked gravel road to the left. This lonely, 12-mile strip of dirt heads straight to the foothills of the Grapevine Mountains. As the road reaches the foothills, it starts to climb and meander among the sagebrush and red rock outcroppings. 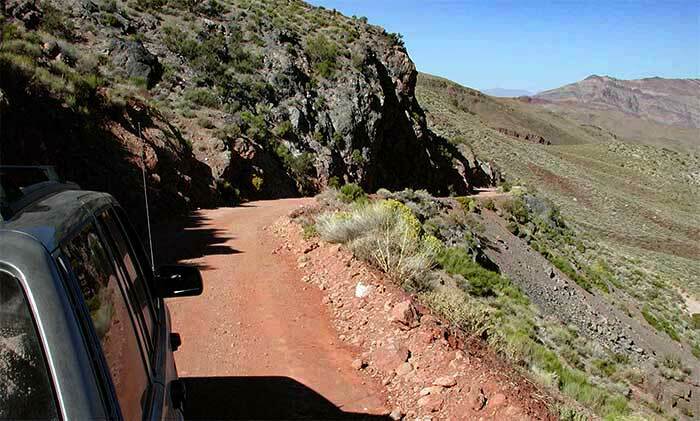 The road becomes steeper and narrower as it approaches Red Pass, aptly named for its red rocks and dirt. A pull-off at the top is worth the time to investigate. A small trail continues up the mountain from the top of the pass. A climb up it is worth the effort, as it reveals a panoramic view of the surrounding mountains and valleys. Hot air from the valley far below will roar up over the saddle that creates the pass. Conglomerate boulders of immense proportions tower above the few sparse trees along the trail. Volcanic dikes protrude out of the landscape like the knife-like edges of black swords. All around is a peaceful desolation of awe-inspiring scenery. The road is now ready to descend into the recesses of the canyon. It winds down quickly to the bottom of the mountain and then is channeled into the confines of a canyon for a number of miles. The road is always going down; continually getting narrower. The canyon walls creep closer and closer, squeezing the road and creekbed into one. We stop 7 or 8 miles from the pass for lunch; a gravel bar is our parking lot. The walls virtually come straight down to the 40-foot-wide canyon floor. A large boulder, maybe 30 feet tall, rests in the middle of the dry creekbed. 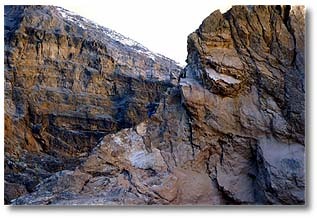 When there is water, it winds around the massive boulder but is, consequently, forced into an undercut in the canyon wall. The mountains rise hundreds of feet straight up around us; layers of rock, twisted and deformed from the tremendous forces of the earth, fold grotesquely upwards. The sun's rays do not penetrate this deep into the bowels of the earth. All is shadowed and mysterious, seemingly without life. Ironically, a jovial songbird is heard in the distance, and the caw of an occasional crow echoes down the gorge. We continue to descend into the recesses of the earth. An occasional wide spot betrays the presence of a spring. Water, traveling miles underground, seeps to the surface and nourishes a collection of tall grasses and insects. This particular spot also has some ancient Indian petroglyphs visible on some boulders along the creek. In a thirsty land, though, the water disappears into the sand within a quarter of a mile. We can tell that we are nearing the main valley. The road and creek bed have long since merged, making our roadway a mere 10 or 12 feet wide. The walls on either side extend vertically beyond view to dizzying heights. High on the canyon walls the polished conglomerates sparkle like the tiled floor of an ancient Roman bath. Every now and then a log or piece of debris high on a ledge betrays the powerful force of flash flood waters. The roadway grows steeper and steeper, the walls closer and closer, the shadows deeper and darker as the meanders grow more frequent. Finally, around the last bend, the canyon belches us out into the main expanse of Death Valley. We feel rocketed out of the bowels of the earth and into the bright sunlight at the mountain's base. Incredibly, when we reach the road a few miles down the alluvial fan, we look back at the valley entrance to Titus Canyon and can hardly distinguish it from the other numerous canyons cleft in the mountain range. 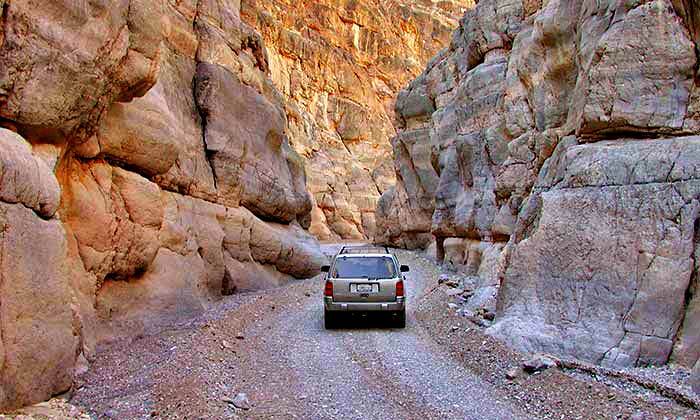 Titus Canyon is but one of the many unbelievable trips that are available to visitors at Death Valley National Park. 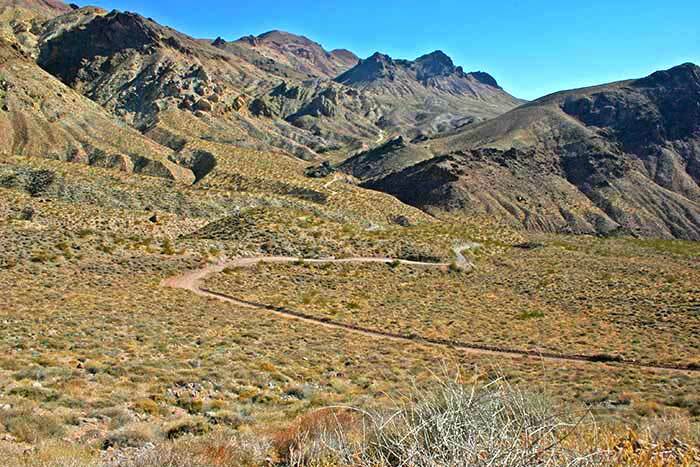 Take the time to travel the canyon because it's part of the special landscape that gives Death Valley its unique character. It's worth experiencing.